Solution type product which can extract high yield and purity of Total RNA from cell, tissue or plant, etc. with the easy and simple steps. 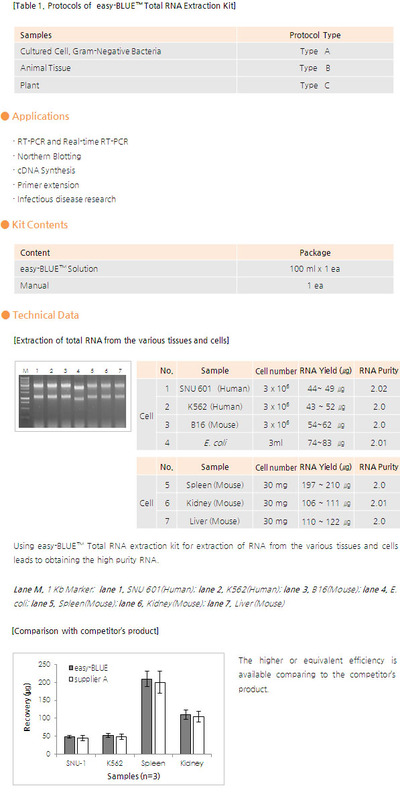 · Extraction of total RNA from solid type samples such as cell, tissue and plant, etc. · Easy distinction between aqueous phase and phenol phase by the deep-cyan blue colour solution. · High yield and purity of total RNA extracted by high purity water-saturated phenol. · Specialised protocol offered for each sample. 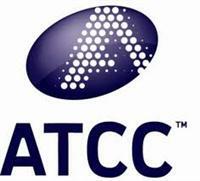 · Accurate downstream applications by perfect removal of cross-contaminant. Easy-BLUE™ Total RNA Extraction Kit in solution type can extract total RNA from the solid type samples such as cell, tissue and plant, etc with the easy and fast steps. In order to effectively extract RNA from cell and tissue, the effect melting of the samples is required, nucleic acid protein should effectively be denaturalised and finally the activity of RNase originated from cell should be controlled. In this point of view, easy-BLUE™ Total RNA Extraction Kit is a product which can effectively extract RNA from tissue and cell. In case of the appropriate sample amount prepared, it can theoretically extract pure RNA with almost no contamination of protein and genomic DNA. 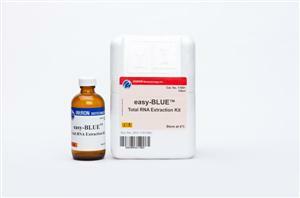 easy-BLUE™ solution using high purity water-saturated phenol can obtain high yield and purity total RNA. The specialized protocol for each sample (table 1) is provided so that users can easily and conveniently obtain the result of high reproducibility. Total RNA from samples using easy-BLUE™ can be immediately used for cDNA synthesis, RT-PCR, Real Time PCR and northern blotting, etc.